The best synth in Reason. Make it yours. Excellent set of features and effects. Sounds brilliant. Still missing a few of the features found on the original. 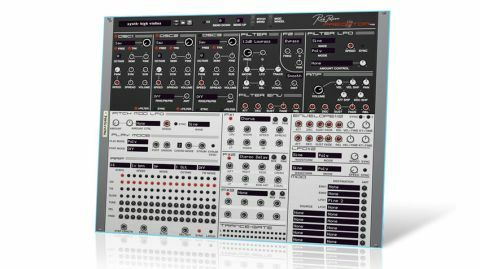 Predator-RE packs almost all of Rob Papen's acclaimed Predator synth plug-in into a Reason Rack Extension, complete with CV and Gate inputs, arpeggiator outputs and around 4000 presets. Despite a few missing features (vocoder samples, preset morphing, a couple of effects and a few modulation slots), the sound is identical to that of its big brother, running, as it does, off the exact same engine. "Predator-RE's architecture is straightforward but comprehensive"
A three-oscillator synth, each oscillator offering 128 waveforms (all your analogue favourites alongside a ton of spectrals, additives, 'vocals' and more), Predator-RE's architecture is straightforward but comprehensive. You've got PWM, FM, phase modulation and ring modulation, a square-wave sub per oscillator, two filters with 27 types (one with a dedicated LFO), five modulation assignments, two LFOs, two envelopes, a shedload of effects, and a deep arpeggiator. Predator is thought by many to be Papen's best synth, so it comes as no surprise that the RE version is the best synth in Reason - yup, even better than Thor in terms of raw sonics.